DOOMSTERS, GRUNGERS, SLUDGERS, STONERS, & PAGANS Unite! The Maryland Doom Fest celebrates its 5th anniversary next year and is extremely pleased to present the full lineup for this special 2019 weekend event! 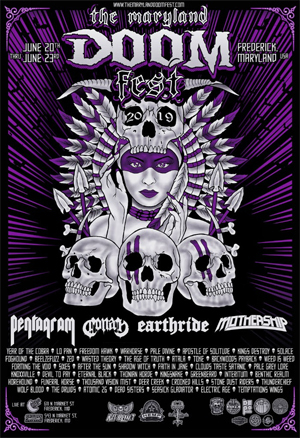 The Fest has confirmed FIFTY of the heaviest, most talented bands to grace the stages of two venues this year. For the first time in its history, MD Doom Fest is bringing international artists, with INTERITUM from Tasmania and CONAN from the United Kingdom, and 48 more beloved USA acts coming from coast to coast! As if the 5th Anniversary of MD Doom Fest is not enough, the Pre-Fest Party on Thursday, June 20th will also be a 20th Anniversary celebration of the Stoner Hands of Doom Festival (ShoD), with a spectacular lineup. These bands have all performed at great SHoD fests of years past! The Pre-Fest / SHoD 20th Anniversary Celebration will be monumental in countless ways. We invite all to become part of the family at The Maryland Doom Fest 2019 Pre-Party and weekend events! Please support the Doom and Heavy Music scene and share this epic event with your compadres, fans, and followers. We will see you at #4daysofdoom!! Early Bird Discount Tickets are available from December 17th through 31st (details below). Early Bird Discount Tickets available from December 17th through 31st. Weekend Pass holders can attend Pre-Fest for $15 at the door, all others $30.